Bill Barr on the way to becoming the next US Attorney General…. This would be Barr’s second go around in the job…He held the position in the Bush II admin…. His confirmation only needs a simple majority and there are 53 Republican Senators…. A few Democrats are expected to join the Republicans in voting for Barr…..
Nobody will miss Matt Whitaker at the job ….. The Senate advanced William Barr’s nomination to be attorney general on a key procedural vote Tuesday, paving the way for his confirmation later this week. The Senate agreed to end debate on the appointment on a 55-44 vote, with three Democrats joining nearly every Republican in voting for Barr. Although Barr is expected to be confirmed by the Senate in the coming days, he came under scrutiny during his confirmation hearing from Senate Democrats wondering how he’d handle special counsel Robert Mueller’s investigation into Russian meddling in the 2016 presidential election and whether Barr would make public Mueller’s final report. Although Tuesday’s vote was largely along party lines, Democratic Sens. Doug Jones of Alabama, Joe Manchin of West Virginia and Kyrsten Sinema of Arizona voted for Barr. Sen. Rand Paul of Kentucky was the only Republican to vote against him. Paul told POLITICO on Monday he opposed Barr’s nomination because he was concerned Barr would not sufficiently safeguard privacy rights…. The three Democrats who voted for cloture are Joe Manchin of West Virginia, Kyrsten Sinema of Arizona and Doug Jones of Alabama. Cory Booker (New Jersey) did not vote. And Rand Paul of Kentucky, as the article notes, was the only Republican to vote Nay. We KNEW that lawmakers in Trump friendly places WOULD go along…. Schumer isn’t gonna complain about the votes…. He’s playing the long game…. 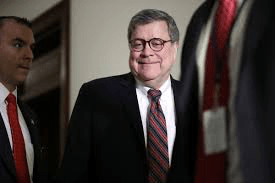 The few Democrats in Trump states voted FOR Barr…. Sens. Doug Jones (Ala.), Joe Manchin (W. Va.), and Kyrsten Sinema (Ariz.).